As you know effective from next Sunday the Department of Communities Tasmania (DCT) comes into existence. DCT brings together the Human Services units of DHHS with the Communities units of DPAC into a single Agency. While this all sounds simple in theory it has turned out to be far more difficult in practice. One of the difficulties has been that employees in DHHS are employed on a different Award that has slightly different conditions to employees in other Agencies like DPAC. While the differences are relatively minor, a shift from one Award to another could disadvantage some employees and that needs to be avoided. Eventually everyone acknowledges all DCT staff need to be on the same set of wages and conditions however the speed with which the establishment of the new Agency has occurred has meant there has not been sufficient time to resolve the Award issues for the long term. What we have done instead is to negotiate 'no disadvantage' arrangements that will apply until 28 February 2019 to give us 8 months to talk to you about your future Award coverage and put in place a long term solution. In the meantime nothing changes. If you are classified on the Health and Human Services Award today then that will continue. If new staff join your workplace they will be employed on the same conditions as you. If you are classified on the Tasmanian State Service Award today then that will continue and new staff in your workplace will also be employed on that Award. The next few months are likely to be challenging for all of you as DCT gets up and running. 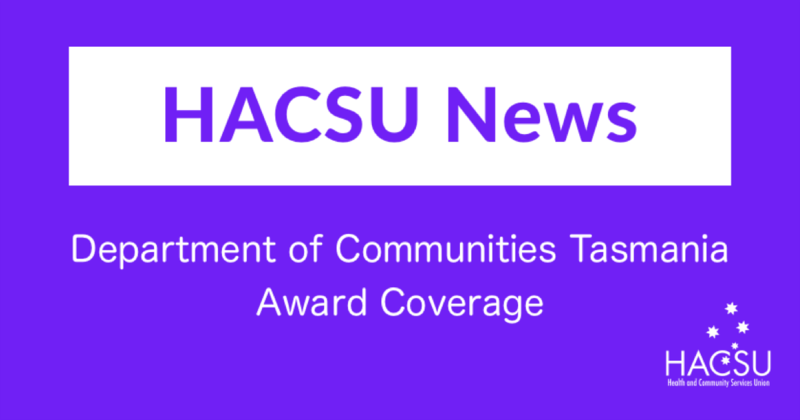 HACSU and the CPSU are here to support you so if you have issues let us know so we can work with you to resolve them.